If you're interested in finding a compact pickup truck that is more than just a typical truck, then take a closer look at the 2019 Toyota Tacoma. Our Tacoma models at Handy Toyota are built to tackle the highest towing or payload ratings, but rather to tackle tasks around your home and preferably to head out on exciting off-road adventures throughout St. Albans and beyond. Whether you've experienced the Tacoma before or are considering one for the first time, then the latest Tacoma is equipped to excite local drivers with a bold style and exciting performance. Take a closer look at the changes with the new Tacoma, as well as its performance, range of features and technologies, powertrain options, and much more with our staff at Handy Toyota! The 2019 Tacoma doesn't offer a slew of substantial changes, but what it does add makes the exciting compact truck even better for owners. Bilstein Shocks and a Multi-Information Display are new features that are available for drivers interested in upgrading to higher trims. The Lane Departure Alert system has been updated for greater efficiency, which is good news for all buyers. Lastly, there is a new SX Appearance Package, as well as a new Desert Air Intake for the TRD Pro model. Though the compact pickup isn't intended for a high-performance, the 2019 Toyota Tacoma is an exciting truck to drive. The standard Tacoma engine is a 2.7-liter four-cylinder engine, which is capable of producing 159-horsepower and 180 pound-feet of torque. If you're in need of more power and torque from your Tacoma, then look no further than the available 3.5-liter V-6 engine - a powertrain with a more impressive output of 278-horsepower and 265 pound-feet of torque. While it isn't meant for heavy-duty towing, the Tacoma can provide its owners with a consistent towing capacity, good for a variety of uses. The 2019 Tacoma truck has a towing capacity of 6,800 pounds when properly-equipped, which is perfect for traveling with camping trailers, dirt bikes, and ATVs. Beyond its towing ability, the Tacoma can also transport up to 1,440 pounds in payload; ideal for easy moving or equipment hauling. The 2019 Tacoma sticks with the same six trim levels as its predecessors, ranging from the SR and SR5 to the TRD Sport, TRD Off-Road, Limited, and TRD Pro. Interested buyers have the choice between three caboose lengths - Regular, Long, and Short - as well as the Access and Double Cab styles. In addition to the engines and packages available for your consideration, the Tacoma is easily capable of offering a great amount of customization for your specific lifestyle needs. If you're interested in hitting the trails, then the TRD Sport, TRD Off-Road, and TRD Pro are Tacoma trucks built perfect for you. Fully equipped to tackle any and all terrain that stands in your way, these outfitted models have set a new standard for Toyota off-road performance - making it a great choice for Vermont roads. Are you ready to take a closer look at our newest Toyota Tacoma trucks in St. Albans? Here at Handy Toyota, we're exciting to offer a large selection of 2019 Tacoma trucks and different trims, bed lengths, and cab sizes. Our new inventory is well-stocked to suit your needs at 701 Highgate Road, so don't delay stopping in and see more today! When you're looking for a pickup, you want the power to handle the jobs you throw at it. The Toyota Tacoma gives you 278 horsepower and 265 pound-feet of torque, significantly more than the Canyon's standard four-cylinder engine. From off-road to on the job site, the Toyota Tacoma is equipped to handle it all. Features like the power vertical sliding rear window and larger interior space make this truck comfortable at all times. 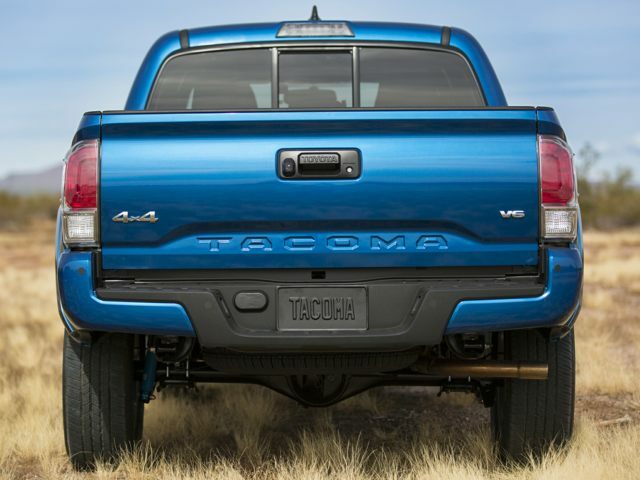 The Toyota Tacoma offers great standard safety than the GMC Canyon. The standard brake assist system helps you maintain constant safety at all times. At equitable trim levels the Nissan Frontier comes in at a higher price tag than the Toyota Tacoma. Even at a lower price tag the Tacoma offers greater value than the Frontier can. The six-cylinder engine of the Tacoma offers greater fuel efficiency than that of the Nissan Frontier. More fuel efficiency doesn't mean less power in the Toyota Tacoma. The Tacoma offers 278 horsepower, and the six-cylinder engine of the Nissan Frontier just can't match up.